Data from the E3 Alliance suggests that dual-language students often have better phonetic skills than their single-language counterparts. 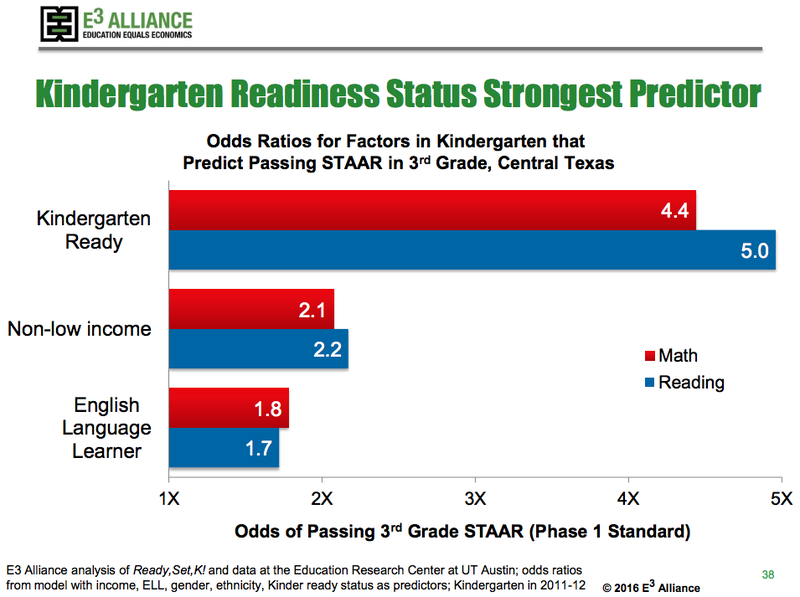 New data from the education non-profit, E3 Alliance, shows that students who enter kindergarten and speak a language other than English are actually twice as likely to pass the third grade STAAR test. E3 Alliance found when you take into account family income level and how ready a child is for kindergarten, English language learner (ELL) students are much more likely to pass the reading and math tests in third grade. Third grade is an important year—those scores are often a predictor of college success. More than a third of students in Central Texas pre-K programs are English language learners. E3 Alliance looked at third grade student data from the 2014-15 school year. “In the case of ELL, that second language actually helps move them forward more than economic status brings them down,” she says. Koenig says, if you think about it, these students are learning more words by learning them in two languages. “How many words do I know? Well I know the word red and I know the word rojo. Are they the same word? Do they count as one? What we’re seeing in the educational research is more often they count as two words,” Koenig says. Most of the region’s ELL students are in elementary grades. They gradually phase out of the bilingual program as they learn English. In Central Texas, most bilingual students are raised in low-income families. The stress of living in poverty can negatively affect their performance in the classroom. But E3 Alliance found, among low-income students, those previously in bilingual programs perform as well or even better on state tests than low-income students who only speak English. 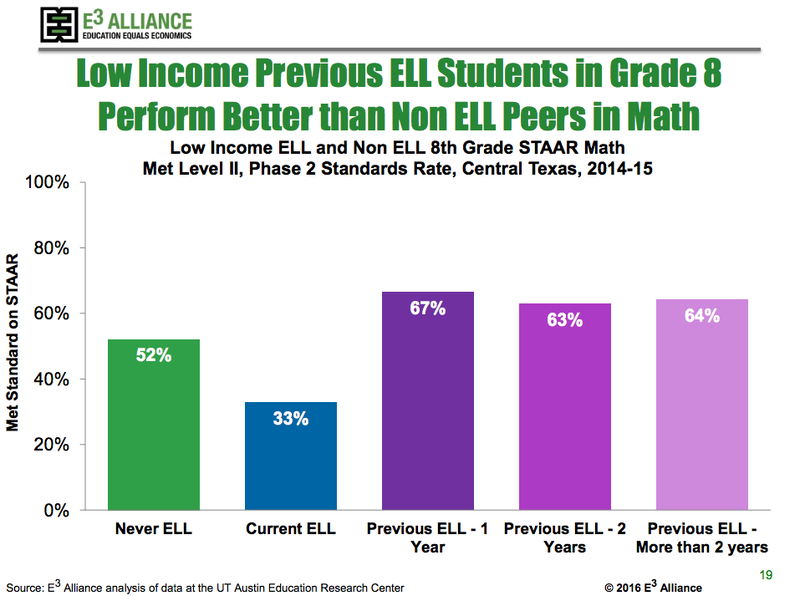 Last year, low-income 8th grade students who recently phased out of the ELL program scored 15 percentage points higher on the state math test than other low-income students. For nearly five million students in the U.S., English isn’t their first language. In Austin ISD, some of those students are sent to a special school for international students, a school where dozens of languages are spoken. There, the idea is to help the students learn English before sending them back to their neighborhood high school. But something else happens as well. Asians and Asian-Americans will outnumber African-Americans in Austin over next several years, according to city estimates based on new numbers from the U.S. Census Bureau. The Austin Independent School District, where students speak 86 languages, is working to accommodate changing demographics. Gov. Greg Abbott warmed up his bill-signing pen on Monday, approving a measure ensuring that some high school seniors who fail to pass state exams can seek an alternate route to graduation. Two more elementary schools will offer dual language programs in the Austin Independent School District this fall. Sunset Valley Elementary and Travis Heights Elementary will join Becker, Ridgetop, Perez and Wooten elementary schools. The program will be offered to Pre-K and first grade students only, and will expand as students age.